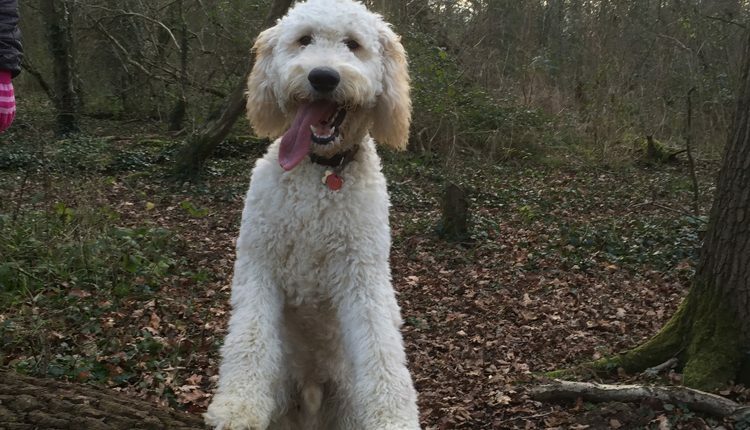 Boris the Golden Doodle is in need of a loving and permanent new home, can you help? Boris is a well socialised, calm, happy and cuddly dog that walks exceptionally well on the lead and has good recall. He is calm around visiting children, good with dogs and settles well in the home. We are looking for a special home for Boris as he is quite a unique case. The 3 year old neutered male was diagnosed with Oesophageal dysfunction earlier this year. This means that he can regurgitate his food and has a high risk of aspiration pneumonia. Boris has been a working dog and loves to learn, due to his condition he is not able to perform certain tasks but would be happy to continue with basic training to give him mental stimulation. Boris must have his food ground and soaked prior to eating. He must eat only when sat in a ‘Bailey chair’. He has been trained to sit in this and is quite comfortable to do so. The whole process of feeding Boris his meals can take 45 minutes to an hour, including preparation and feeding time. Boris should be fed 3-4 times a day rather than 2 big meals. The treats used for Boris must be of a small size and not too many at a time. Boris is on a medication to prevent acid reflux. Boris would need to remain with his current insurance policy to ensure that his pre-existing condition is covered for life. Boris must not be able to scavenge at home or when out on walks. For this reason Boris has been trained to be comfortable wearing a Baskerville muzzle to prevent him eating anything he shouldn’t. Boris loves his toys but can only manage very gentle games. Boris currently has hydrotherapy to keep his core strong and physiotherapy to ensure he does not get back issues from sitting in the Bailey chair regularly. As Boris needs dedicated and specialist care, we will be willing to look outside of our normal rehoming radius’. Can you offer Boris a loving and permanent new home?